This is your classic beach chair, just with a fancier name. Low to the ground beach chairs are designed to sit fewer than 12 inches from the sand. Some models are designed to sit as low as 5 inches off the ground, taking you just off the surface of the beach. Just like any other beach chair design, this option is designed for user comfort while providing some specific features that other designs may not offer. At the same time, you’ll be able to meet most seat-height requirements that may be present for the beach or your preferred activity. This chair design is rarely 23 inches above the ground, making it a convenient seat that is lightweight, portable, and comfortable. Most chairs in this category are rated to hold at least 250 pounds at their maximum capacity. How Are Low to the Ground Beach Chairs Different? The obvious difference between a low to the ground beach chair and other design options is the height users are above the ground. Low-profile chairs are typically 5-12 inches off the ground. Other chair designs, including portable and heavy-duty models, may be more than 24 inches off the ground. There are also some storage and transport considerations to evaluate. Many models in this category will recline, but only a handful will actually fold-up for storage. You’re often forced to carry these chairs on their own, without a strap or carrying bag. You may have a lounging feature with this classic design, though additional features, like a headrest, might not always be present. 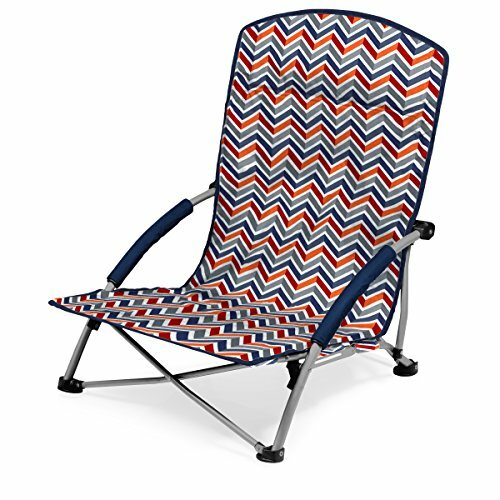 Are Low-Profile Beach Chairs Comfortable? Many people find a low-profile beach chair to be just as comfortable as any other chair design. It provides an advantage over sitting in the sand as you are no longer exposed to the various crawling creatures that may call your beach their home. Individuals who struggle with sitting down or standing up from a standard chair will find a low-profile chair to be quite uncomfortable. Those with joint issues that become painful with deep movements. Households that have a primary beach which is rocky, with numerous pebbles, and few stretches of sand. It’s one thing to sit down in a low to the ground beach chair when there’s a comfortable patch of sand underneath. It’s a whole different story when you sit down and there’s a sharp, pointy rock coming right up at you. There is also this standard rule of thumb: bad backs and beach chairs are rarely a friendly combination. If there is ever a question about your health and using a beach chair, then be sure to have a conversation with your doctor first. It’s always better to err on the side of caution. For most people, however, the low-profile design is one of the most comfortable options that is available in the industry today. Many folks love to stretch out their legs while they sit in their beach chair. This facilitates an even tan and relieves muscle cramping that can result from higher chair designs. Most low beach chairs come with multiple positioning options, including a full recline feature, that further increases personal comfort. Lay on your back or your stomach to improve the tan, take a nap, or relax in a way that suits you best. Who Benefits from a Low-Sitting Beach Chair? Anyone who enjoys having an ultra-stable sitting experience at the beach is going to enjoy what low beach chairs are able to provide. These shorter chairs have the same base width as other chair designs, but with a lower center of gravity. That means you can avoid the pyramid-style legs that are found on heavy-duty beach chairs, while enjoying less wobble from chair designs that sit you higher up off the ground. Many of the chairs in this category are very affordable as well. If your household is on a tight budget, you’ll find several feature-rich options available that may not always be offered in other beach chair categories. Why Purchase a Low to the Ground Beach Chair? A low to the ground beach chair is the perfect option for those who love the classic beach experience. You’re able to be off the ground and have room to stretch out. At the same time, you’ll find numerous style and color options that fit your personality and taste. There are several feature options available from today’s manufacturers, allowing you to pick a chair with the perfect details. 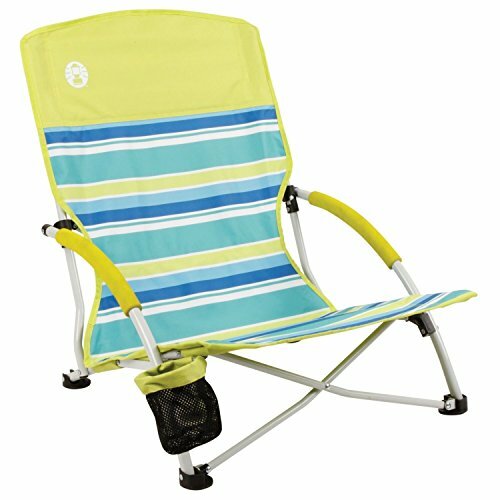 If you want to enjoy a comfortable day at the beach, this classic chair design offers an affordable adventure. Find your chair today and begin planning your next beach adventure.